Hi DIYers! If you haven't heard yet, a new firmware version for the 2GIG GC3 System is now available. This update provides support for the system's screensaver feature, and it allows video demos to be uploaded to the panel. It also fixes a few minor bugs that were known to cause issues. The firmware update is version 3.2.1.6653. Although the changes it offers are relatively minor, it's still worth downloading for users who want to get the very most out of their GC3 Systems. The biggest change is the addition of the screensaver feature, which will also likely be referred to as the slideshow feature. Users can add personal photos to a USB drive and transfer them to their GC3 System or associated 2GIG SP1 Keypad. They can then arrange these pictures to appear in a slideshow, which will automatically go into effect if the system is left unused for a certain period of time. These options are available in a new My Photos Menu found within System Settings. Also included in the update is the video demos feature. Although this feature was intended with alarm dealers in mind, there's no reason why it can't be used by end users as well. Users will transfer personal video clips to the panel through a USB drive. They can then use the new Demo Menu option within the Installer Toolbox to add demo videos to the panel. Just like with the slideshow feature, the demo videos can be viewed from both the GC3 System and the 2GIG SP1 Keypad. Both photos and videos are uploaded independently so that a user can have different slideshows and demo videos between their system and their SP1 Keypads. Other updates included fixed to low-battery indications and problems with the Access Point mode. If you want to download this firmware update, please check our GC3 Firmware Update Page. Download the necessary file, and transfer it to the root directory of a USB drive. You can then insert the USB drive into the top of the GC3 System. Then confirm the update, and provide either the Master Code or the Installer Code (default 1561) to begin. The system will reboot, and the update will be applied. Alarm Grid customers can also ask us to push the update down manually. However, this will include added costs. If you have any questions about this update please email support@alarmgrid.com. You may also call us at (888) 818-7728 during our normal business hours of 9am to 8pm EST M-F. We look forward to hearing from you! Hi DIYers! We have great news for 2GIG GC3 owners. Nortek, the owners of 2GIG, has officially announced that the 2GIG GC3 now has partitioning support available. The update comes via the Firmware Version 3.2 release. This release makes the GC3 our first wireless panel with partitioning. If you aren't familiar with partitioning, it refers to the practice of sectioning off an alarm system into different groups that are called partitions. This allows zones within the designated partition to be armed or disarmed while the system zones outside that partition remain unaffected. For example, if a specific system partition is disarmed, then all of the zones within that partition will become disarmed. But the rest of the system will remain armed. Partitioning features are somewhat similar to bypassing zones, but it does not require each zone to be individually bypassed. In the case of the 2GIG GC3, the partitions are referred to as "Smart Areas". Every Smart Area can be individually and set up for its own alerts and notifications. Any zone within a Smart Area be individually bypassed if needed. The system will support a maximum number of four different Smart Areas. Each Smart Area can be assigned its own set of access codes. This is excellent for restricting access to certain Smart Areas. The Smart Areas option for controlling this feature is easily accessible from the main screen of the 2GIG GC3 System. Other features for 2GIG GC3 Firmware Version 3.2.0 include the support for up to eight wireless keypads (SP1, SP2 and PAD1), better support for Z-Wave smart home devices, fixes with the French and Spanish language options, updates to broadband network programming (Q33, Q34 and Q35) and general networking improvements. To apply the update, download the current firmware file on this page. Extract the downloaded file, and save the firmware file to the root directory of a USB drive. Then plug the USB drive into the top of the 2GIG GC3. The system will ask you to confirm the update and provide either the Master Code or the Installer Code (default 1561). The system will then reboot and perform the update. Additionally, Firmware Version 3.2.0 has received approval from Alarm.com, and the update can pushed down over-the-air (OTA) by an Alarm.com dealer. Please note that performing an OTA update will include added fees that may be passed on to the user. However, updating through a USB drive will not feature any added costs. At Alarm Grid, we often encourage users to "roll with what they got" and get as much as they can out of their current system. But there are some cases where enough is enough, and upgrading to a brand-new panel is the best option. Here are 5 reasons for you to make a system upgrade. 1. You don't know the Installer Code. Virtually every alarm system comes equipped with a default Installer Code that is absolutely necessary for providing basic programming functions. We recommend leaving this code at the default because it can be very difficult to get into programming if you lose this code. Additionally, you might not know the system's Installer Code if it was monitored by a different company that intentionally changed the code. Some systems will technically allow you to get back into programming even if you lose this code. However, this can be a tedious process, as you may need to reset the system to factory default settings. This would require you to reprogram every sensor for the system. And some systems don't even allow this. So if you lose your Installer Code and can't get back into programming, sometimes the best option is to just start fresh with a completely new security system. Depending on the system you choose, you may even be able to keep all your old sensors as well. 2. You want more reliable communication. Nearly every alarm system on the market today is capable of achieving a dual-path communication setup with WIFI and cellular connectivity. This type of setup will provide ultra-fast speeds and excellent reliability. Even many older systems can be upgraded to achieve a similar setup. Cellular connectivity in particular is highly important for anyone who is serious about receiving reliable alarm monitoring services. Unfortunately, some older systems are stuck using phone line monitoring, and they cannot be upgraded to a superior communication path. Using a phone line is extremely discouraged, as it is an outdated technology that offers unreliable service and slow connection speeds. Not to mention, phone service has some serious issues of its own. So if you're still using an alarm system with phone line connectivity, and you want more reliable and faster monitoring, it might time to make a change. 3. You want easier daily access. Many older alarm systems are controlled through touch-button keypads that are wired in with the system. While this is fine for many users, it doesn't necessarily compare with the convenience of a touchscreen controller. This type of control will make it much easier to perform daily tasks like arming and disarming from the panel. And while there are certain touchscreen controllers for certain systems (e.g. 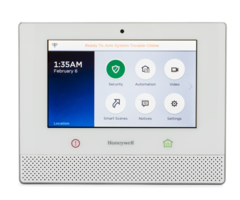 the Honeywell Tuxedo Touch for VISTA Panels and the Interlogix Two-Way Talking TouchScreen for Interlogix Panels), they are often very expensive in their own right. Many users often find that the best option is to simply ditch their hardwired system entirely and upgrade to a new wireless one with a touchscreen. And even if you have a large number of hardwired sensors, you can probably bring them over with a compatible wired to wireless converter. For example, the Honeywell 5800C2W will allow hardwired sensors to be used with a new wireless Honeywell System. 4. You want more advanced sensors. Alarm sensors are continuing to become more and more advanced over time. And eventually, certain features that are added will simply be incompatible with an older system. An example of this involves the Honeywell SiX Series Sensors and the Qolsys S-Line Sensors. These sensors are both protected by 128-bit AES encryption, which makes them virtually impossible to takeover or hack into. However, this encryption limits their system compatibility. For the SiX Series Sensors, they can only work with Honeywell Lyric Panels. Meanwhile, the Qolsys S-Line Sensors will only work with the Qolsys IQ Panel 2. It's not to say that older legacy sensors are bad or anything. They will work just fine with a security setup. But they aren't always going to offer the same advanced features and capabilities as newer sensors. So any users who want to incorporate more advanced system sensors into their setup may need to make an upgrade. 5. You want to obtain a smart home. Older alarm systems are often limited in how they can be controlled remotely. They are also sometimes restricted in their functionality with smart home applications, such as Google Home and Apple HomeKit. Most of this is done through an interactive service platform, like Honeywell's Total Connect 2.0 or Alarm.com. 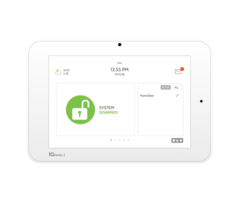 In fact, most security experts would agree that an alarm system is fairly outdate if it cannot connect with an interactive service platform. An interactive service is usually accessed through a web browser or through a mobile app on a smartphone. There are some useful basic features that come with virtually any interactive service. These features include arming and disarming the system, checking the status of sensors, controlling Z-Wave home automation devices and viewing the live feed of programmed security sensors. So with access to an interactive service platform, these actions can be performed from nearly anywhere in the world. Most smart home devices follow a certain protocol when interacting with an alarm system. In these cases, an interactive service platform typically acts as a "middleman" between the smart device and the security system. Any command that is is sent through the smart device (e.g. a Google Home device or an Amazon Alexa device) will first be sent to the interactive service server (e.g. Total Connect 2.0 or Alarm.com) and then to the system (e.g. the Honeywell Lyric Controller or the 2GIG GC3). However, this type of access can be impossible for older alarm systems. So if you want to obtain a smarter home security setup, upgrading your system may be a good first step. So, which system is right for me? If you're in the market for a new system, we generally recommend choosing a wireless system. Most users find that wireless systems are easier to program, and they will provide all-in-one access for the user. These systems are also compatible with some of the most advanced sensors on the market, and they can all be used with an interactive service platform. Our most favorite systems are the Honeywell Lyric Controller, the 2GIG GC3 and the Qolsys IQ Panel 2. These are all outstanding wireless systems that will provide tremendous functions and features for an end user. They are also each compatible with certain smart home applications. Make sure to check compatibility before making your decision if you want to achieve a smart home setup. But regardless, you can't go wrong with any of these outstanding systems. While we wait for Honeywell to release their exciting security system, the Lyric, 2GIG has finally released their anticipated panel, and Alarm Grid is the first DIY outfit to make it available! If you are one of the many people who have been awaiting the arrival of the much anticipated GC3, then this is an exciting day for you. The GC3 is 2GIG's much needed update to the Go!Control 2, which has been the workhorse of the brand since 2010. In 2011, the panel was unexpectedly awarded "Security Product of the Year" at the Consumer Electronics Association (CEA), as well as the "2011 Best Wireless Security Panel" award, and "2011 Best in Show" at Electronic Security Expo (ESX). The all-in-one panel was revolutionary, and the ability to use Alarm.com as the interactive backbone of the 2GIG line changed the way that the security industry does business. Now, with Honeywell's LYNX line and the coming Lyric, the Go!Control is a still excellent panel in a sea of many panels that have caught up and, in many cases, surpassed its many features, which in 2011 had never really been seen before. The GC3 is a sleek, new panel that is pulling 2GIG back into the much deserved limelight. The 7-inch, extremely responsive capacitive color touchscreen is a nice touch, as is the information packed display. 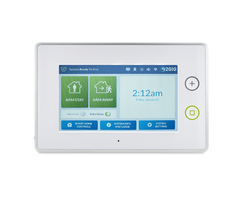 Featuring excellent Z-Wave controls, much like its predecessor and competing Honeywell panels, the GC3 makes it clear that it is a security system first, but under the surface, it is a deceivingly capable device that allows users the ability to control their Z-wave home automation capable devices as well as the ability to receive updates to its firmware. This modern security system can and will keep up with the times - whatever they may bring. While you can purchase a standalone panel, we have also made the GC3PK kit available that includes 3 DW10 door and window sensors, a KEY2-345 key fob, and a single PIR1-345 motion sensor, as well as the GC3 system itself. All you will need to add to that kit is a radio that best suits your needs. At the moment, 2GIG has released radios that work with Verizon and AT&T, or, if you're in Canada, Rogers. These simple radios snap into the side of the GC3, making installation incredibly simple and almost exactly as easy as the process of installing a radio in Honeywell's Lyric controller. In all, it seems, 2GIG has made huge improvements over its older systems, as well as making a number of incredible improvements that will make having this security system a delight.